Lt. Gov. 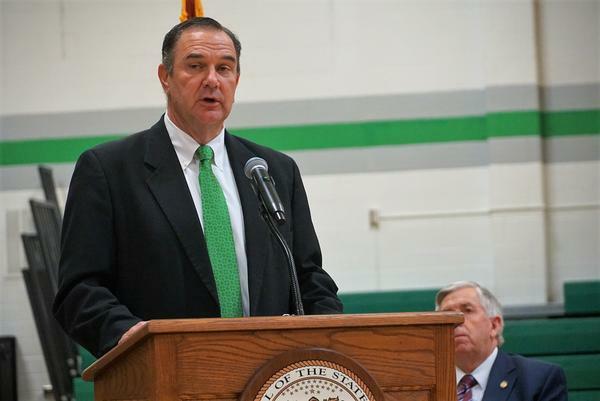 Mike Kehoe speaks at an event last week at Blair Oaks High School in Wardsville. Lt. Gov. Mike Kehoe joins Politically Speaking to talk about his first few months in office — and some of the issues that his Republican legislative colleagues are dealing with during the 2019 session. Kehoe spent nearly eight years as a state senator representing several mid-Missouri counties, including Cole. After he became chief executive last year, Gov. Mike Parson appointed Kehoe as lieutenant governor. The lieutenant governor presides over the Senate and sits on a number of key boards and commissions. But the office came into greater focus last year when Gov. Eric Greitens became embroiled in scandal. After months of uncertainty, Greitens resigned in late May 2018. Parson was sworn in as governor a few days later. Kehoe’s appointment as lieutenant governor prompted a lawsuit from Missouri Democrats, who contended that Parson didn’t have the authority to fill a lieutenant governorship vacancy. That legal effort hasn’t been successful, and Parson received support from members of both political parties in deciding to appoint Kehoe. Parson has appointed Kehoe as the head of several boards and commissions. The governor also endorsed an effort to have the Missouri Arts Council transferred to the lieutenant governor’s office. Since Missouri’s governor and lieutenant governor are elected separately, there’s historically been some tension between the two officeholders — especially when they’re from opposite parties. But Kehoe says he’s worked well with Parson over the past months. Both served in the Missouri Senate together. Kehoe discussed his chairmanship of a task force on school safety, which Parson formed last week at Blair Oaks High School in Wardsville. He also talked about studying the hyperloop, a high-speed transportation system. House Speaker Elijah Haahr formed a panel to look into the technology last week. Kehoe provided his thoughts on the 2019 legislative session and how Parson’s workforce development and transportation plans are faring in the Missouri Senate.